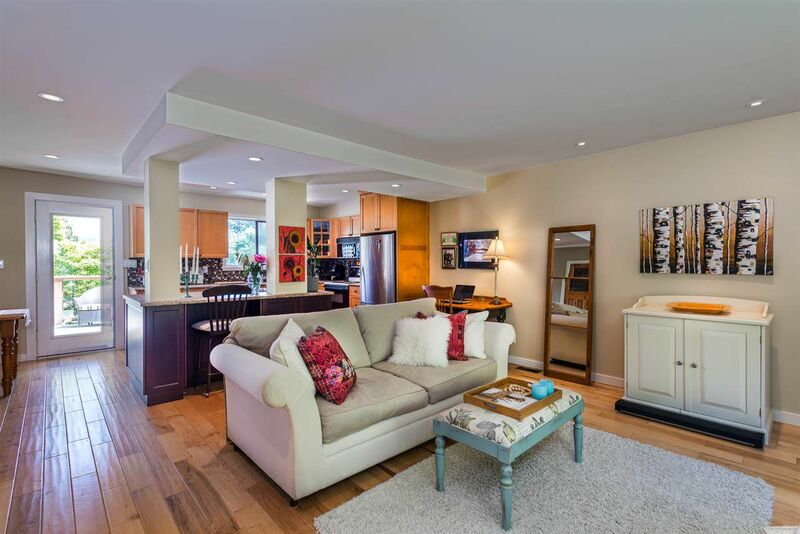 THIS DEEP COVE TOWNHOUSE EXUDES CHARM with a warm cottage-like ambiance. One-of-a-kind 1,822 sq ft end unit with the largest side & back yard in the complex with detached shed in the side yard. The back deck overlooks the quaint garden with whimsical touches & beautiful sprawling branches of the cedar fir & huge maple tree against the peek-a-boo mountain backdrop. Main floor with beautiful maple hardwood, renovated eat-in kitchen with earthy tones, texture & character. The island/breakfast bar opens to the living room featuring a cozy stone-faced gas fireplace. The two lovely, charming bedrooms up could be converted back to 3 bedrooms or turn the lower level into 3rd bedroom. The main bathroom was renovated adding wood cupboards & a skylight that just transforms the bathroom with natural light. So many options for the walk-out lower level (currently used as a studio with office and bathroom). Easily suited with separate entrance. (plumbing roughed in for a kitchen). • Walk to schools, transit, shopping, parks, great restaurants,coffee shops and HONEY’S DONUTS! • As picturesque as a West Coast village gets.